British Columbians should not be lamenting Petronas’ decision to pull its Pacific Northwest Liquified Natural Gas (LNG) proposal. Instead, they should be celebrating the demise of a project built on bad economics, climate change denial and wishful thinking. A few pundits have told the Petronas story as a tragedy. Some are blaming the brand new NDP government, others the BC Liberal predecessors for not moving faster to land a deal. The real culprit is the abysmal economics of LNG—the need for expensive new pipelines and terminals, and the high costs to liquefy gas and transport it across the Pacific. These investments would only make sense if prices were way higher then they currently are. Optimistic predictions for LNG were made based on a few years when gas prices were abnormally high. This figure from the International Gas Union shows that prices in Japan (green line) and the rest of Asia (orange line) shot up in 2011 and stayed high through the start of 2015 before falling below the $10 per mmBTU (1 million British Thermal Units)—the estimated break-even point for LNG exports from BC. Looking forward, it is highly unlikely that gas prices will return to the highs of 2011–2014. Global LNG export capacity is poised to grow by a third by 2020 based on facilities currently under construction. 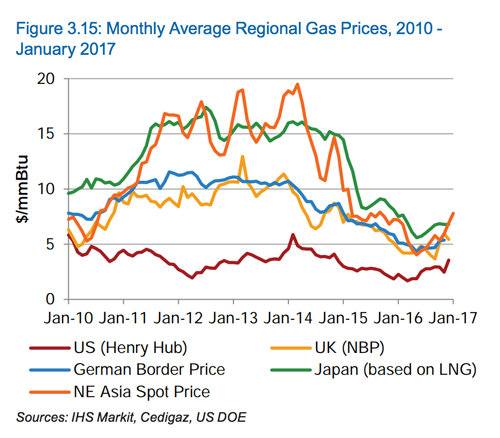 Going back to 2013, those high Asian prices fuelled dreams of LNG riches in BC. It was a perfect Hail Mary pass for a tired government seeking re-election. Public resources were used to pay consultants to quickly manufacture electoral propaganda—100,000 jobs! $100 billion Prosperity Fund!—for use in the 2013 campaign. So what if BC had managed to stake out some LNG turf? Let’s turn to Australia where recent developments strongly suggest we should count our blessings that we did not win the LNG sweepstakes. Australia is no neophyte: it has produced LNG since 1989. But its current woes can be traced to a flurry of investment decisions made between 2009 and 2012, totalling $200 billion in new LNG investment. This is now widely seen as over-investment. Key public policy challenges in Australia are flagged below, but it is of note that even the LNG industry itself has been squeezed between high costs and low prices, with major companies writing down the value of their LNG investments by billions of dollars. While Australia is now poised to become the world’s largest LNG exporter by 2020, “success” turned into a political crisis by early 2017. Just as the taps were turned on for three massive new export projects on the country’s east coast near Gladstone, Queensland, prices shot up for Aussie households and businesses in major urban areas like Sydney. Local prices for gas at one point cost more than the gas it exported to Japan. This April, Australian Prime Minister Malcolm Turnbull announced the government would begin imposing restrictions on LNG exporters. A new Australian Domestic Gas Security Mechanism came into effect July 1 and will force gas producers to direct more supply to domestic users. The hidden objective of LNG exporters all along was to raise domestic gas prices. Such domestic energy security issues are precisely what CCPA research associate David Hughes has raised in the BC context. Hughes has noted that a large LNG industry means the rest of Canada would need to become net importers of natural gas while the BC government has been vastly overstating the amount of gas we have in the ground. Richard Denniss, Chief Economist of The Australia Institute, argues that the hidden objective of LNG exporters all along was to raise domestic gas prices. Abundant gas supplies and low prices might have been good for Aussie households and manufacturers, but not for the gas industry, which wants to sell its gas for the highest price possible, wherever in the world that may be. Moreover, major new conflicts have emerged in Australia between the gas industry, now aiming to supply huge export volumes, and farmers whose land would have to be fracked to access the gas. As in BC, the battle is largely about the negative potential impacts on water supplies. As the Australian government tilted its tax and royalty regime towards encouraging new LNG investment, the return to the Treasury—for the development of the publicly owned gas resource—has been meagre. In spite of record gas production and exports, revenues from the federal Petroleum Resource Rent Tax fell dramatically in 2016 to their lowest level since 1999. Royalties at the state level (equivalent to Canadian provinces) are also incredibly small. This is reminiscent of BC, which is getting a pittance for its own record gas production. To lure LNG investment, the BC government caved in to industry efforts for a better return to the public treasury. It then went so far as to recall the BC Legislature in Summer 2015 to pass legislation for Petronas that would lock in a favourable tax and regulatory regime. Similar to the BC framework, LNG majors in Australia can fully deduct all of their capital costs before they pay federal resource rent taxes, meaning that cost overruns are passed on to the public sector in the form of reduced revenues. Such cost overruns are common in the LNG industry. Australia’s recent LNG projects have experienced $50 billion in cost overruns, the most legendary being the Gorgon project in Western Australia, which was $20 billion over budget and cost $54 billion to build. One recent report on Australia’s tax and royalty regime for gas found that, due to these and other generous provisions, “the industry will need to record at least $238 billion in profits before a cent in royalties is paid to the Australian people.” LNG exporters in Australia have also been found engaging in creative accounting to write off interest payments for the borrowings of offshore subsidiaries to further reduce their profits and evade taxation. This speaks to the biggest fib in BC’s LNG claims—100,000 permanent jobs. As a result of these shenanigans, a comprehensive review of the tax and royalty regime was ordered by the Australian government in late 2016. There are doubts, however, that meaningful changes will result. This is what “competitiveness” looks like. Ultimately, such deals shortchange the public and represent a transfer of risk from the private sector to the public sector. The Australian experience demonstrates the reality about promises of LNG jobs: the vast majority of jobs occur in the construction stage and completed facilities employ few permanent workers. The Sydney Morning Herald writes that the city of Gladstone has seen a boom and bust due to a temporary surge of workers to build three LNG plants in the area. During the boom housing became unaffordable to locals and seniors and professionals were forced to move away. After a surge of 14,500 construction jobs for a few years, in a town of 60,000, the completed LNG terminals now only provide 500 permanent jobs. This speaks to the biggest fib in BC’s LNG claims—100,000 permanent jobs, a number that was quickly made up prior to the 2013 pre-election Throne speech. It is understandable why economically challenged regions of BC would want high-paying LNG jobs, but the reality is there are few to go around. Those hopes and dreams of BC workers and communities were exploited by the BC Liberal government for political gain. Finally, it’s worth recalling that LNG is just another fossil fuel at a time when the world is trying to get its climate change act together by transitioning away from fossil fuels. BC has wasted political capital, time and money on LNG instead of developing renewables and investing in energy efficiency and climate-friendly infrastructure. Australia’s greenhouse gas emissions (GHG) are projected to grow to at least 2030, and the country will miss its 2020 GHG reduction target by a large margin. This growth is “primarily driven by the development of new Liquefied Natural Gas (LNG) facilities in Western Australia, Queensland and the Northern Territory,” according to the government. In BC, LNG developments would make it impossible for the Province to meet its own legislated GHG targets. The new NDP government will need to reconcile its interest in LNG with its desire to put more stringent GHG targets and a tougher climate action plan in place. Let’s recap: even if BC had an LNG industry today, it would be losing money on every tanker load sent to Asia. The people of BC would be paying higher prices for the gas they consume, while getting negligible public return for all that publicly owned gas. GHG emissions would go up instead of down, and there would be very few jobs. By creating a whole Ministry aimed at bringing LNG to our shores, the BC Liberal government wasted millions in public funds and raised the hopes of workers and rural communities. BC has wasted political capital, time and money on LNG instead of developing renewables and investing in energy efficiency and climate-friendly infrastructure. Had a different course been taken, BC would already be the Saudi Arabia of clean energy and have bona fide bragging rights on climate action. Natural gas is a finite resource. British Columbians should be thankful that government efforts to quickly liquidate it for export have come to naught. Forget the laments in the mainstream media: Petronas’ decision to pull out of BC is a blessing. Just how bad is BC’s LNG deal with Petronas?